Everyone’s giving their predictions for 2010. Here’s mine: Make Sense Or Die. There’s too much content, both online and offline, for everyone to cohabit – meaning those that lack clarity will, by the end of 2010, die. Furthermore those who aren’t making sense probably don’t have much money left to continue not making any sense, so unless they start making sense, they too will die. This isn’t just bloggers. This is everyone in the industry of Social Media, Social Business, and whatever else you can put ‘Social’ in front of. The BS wears off this year, because likeminded people who know what they are doing are getting together – and guess what – they have more than celebrity status to back their talk – they have their own actual case study proof. 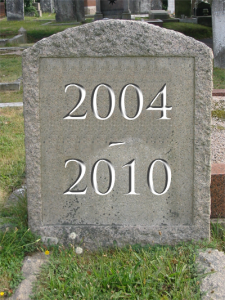 There’s a gravestone out there with a whole bunch of websites and businesses names on it – and the only way to survive 2010 is to make sense. Make sense by providing frameworks, step-by-step actions, case studies and models, or die by producing rehashes of old posts, non-ordered calls to random actions, and posts with toe-deep analysis, while someone else makes the bold move to do the former. Make sense by being real, having personality, and most of all, being vulnerable, or die by being arrogant, distant, and unhuman, while someone else makes the bold move and has the guts to do the former. Make sense by showing us how you’ve walked your own talk, with case studies to prove it, or die by being too much of a celebrity or airhead to roll your sleeves up and work, while someone else makes the bold move to do, and profile how they are doing, the former. Make sense by sharing content that cost you more than time to develop, or die by keeping it locked up while someone else makes this bold move. Make sense by turning the microphone on other people and giving voice to their stories, or die by keeping it on yourself while someone else makes this bold move. Make sense by making Social Media make sense to the bottom line and the early majority, or die while trying to be ‘just like so-and-so’ and becoming another cheap copy of an original, while someone else draws the actual paying attraction by doing the former. Happy 2010. I’m ready to make sense. Are you? Well written, Scott; this makes sense to me! Case study (you asked! ): having spent many thousands of hours presenting training courses (on software development) to many hundreds of people over more than a decade and a half, I can vouch for the breakthrough that occurs when I became more concerned about how “they” (the learners) were going to do today than about how “I” (the trainer) was going to do today. Nevertheless, I frequently slip back to old memes, and have to kick myself! Applying this to the processes of innovation, especially in the use of software, is my challenge these days. Continual development of our understanding of the context in which “they” are receiving our messages causes them to pull the meaning from us with minimal effort on our part. When this is not done effectively, communication is hard work! As you say, and rather like comedians perhaps, we “die”! When done effectively, it is magical! Hey David, thanks for the link – I enjoyed what you wrote. I tweeted it out this morning.